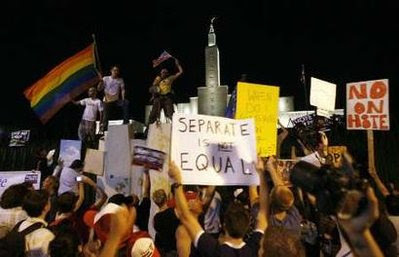 Radical gay activists are protesting the Mormon Church and threatening to burn down Christian churches and hunt down people of faith who supported the ballot measure. And, now this… After 70% of blacks supported Proposition 8 in California, radical gay mobs are attacking blacks at their protests. It was like being at a klan rally except the klansmen were wearing Abercrombie polos and Birkenstocks. YOU N*GGER, one man shouted at men. If your people want to call me a F*GGOT, I will call you a n*gger. Someone else said same thing to me on the next block near the temple…me and my friend were walking, he is also gay but Korean, and a young WeHo clone said after last night the n*ggers better not come to West Hollywood if they knew what was BEST for them. Related… Jawa Report has more on the Left’s post-racial politics.